The divergence in growth patterns among the three metropolitan regions described in the previous chapter is striking. Similar rates of growth in population and housing stock between 1991 and 2001 were distributed quite differently in each case. Vancouver accommodated the vast majority of its growth in existing urban areas, but Calgary did so on greenfield lands. Vancouver directed a substantial portion of infill and redevelopment activity to designated town centres, while Calgary's intensification was sparse and scattered. In both cases, the pattern in Toronto represented an intermediate state relative to the other two regions. Meanwhile, gross urban density declined in both Calgary and Toronto, whereas in Vancouver it increased. Chapters 4 and 5 build on the empirical analysis in Chapters 2 and 3 by comparing the observed patterns of land use change to the evolution of regional governance and planning institutions and policies in each region. Patterns of land use are the product of multiple demographic, cultural, institutional, economic, and physical factors that interact in complex ways. Even if guided by coherent packages of plans and policies, the development of land occurs through countless parcel-level decisions made by multiple actors -- planners, politicians, landowners, developers, builders, banks, insurers, and end-purchasers -- each of whom operates with imperfect information in an ever-changing context (Bourne, 1981; Rybczynski, 2007). As no single model or explanatory framework can hope to account for this complexity, there is little to be gained by seeking direct causal explanations for growth patterns. It is, however, possible to assess the degree to which land development patterns correspond to objectives expressed in policies and plans, while also acknowledging how various factors may reinforce or undermine the efficacy of particular planning policies and governing institutional frameworks. This review is not a comprehensive history of institutional and policy change. It emphasizes large-scale institutional change rather than particular political battles and their participants. It cannot unravel the idiosyncratic political and economic dynamics within each municipality or neighbourhood, which vary significantly across each metropolitan region. Rather, the review is intended to identify antecedents that may have led to the land use patterns described in the previous chapter. Although the focus is on explaining the patterns of land use change in the 1990-2001 period, the review looks back much further in time. In evaluating the effectiveness of policies, we must be wary of "snapshot" approaches. Instead of looking only at the moment at which an institution is created, a law is passed, or a policy enacted, it is also important to consider how long-term trends shape policy choices, how small policy choices contribute to larger outcomes, and how short-term choices have long-term effects (Pierson, 2005). The reviews for Toronto and Calgary commence with the advent of the postwar period, when planning became professionalized and institutionalized, and significant growth began to spill beyond the borders of the core municipalities. In Vancouver, the review reaches back further in time in order to capture the antecedents of later efforts. A table summarizing the review is found at the end of the chapter. the role of comprehensive rural land protection in promoting urban containment. The plans in each metropolitan area do not, of course, use the same terms. Interpretation and inference were involved in the categorization of planning ideas and principles. The analysis of the Toronto region is based on provincial policies and some municipal plans. For the Vancouver region, the principal sources of information are documents published by the Greater Vancouver Regional District (GVRD, renamed Metro Vancouver in 2007) and its predecessor, the Lower Mainland Regional Planning Board, as well as archival materials. For the Calgary region, sources include provincial policies, municipal and regional plans, and background reports. In all cases, secondary sources, including academic journal articles, books, and research reports, have also been consulted. While provincial legislation in Ontario has long provided for a hierarchy of plans -- that is, each authority's policies must conform to those of more senior governments -- day-to-day planning and development control is largely implemented by municipal governments. As a result, planning authority in the Toronto region has become increasingly politically and institutionally fragmented as more municipalities become urbanized, although from time to time the Province has intervened to impose frameworks and policies to overcome this governmental fragmentation. Like many other cities in North America, Toronto accommodated growth during the 19th and the beginning of the 20th centuries by annexing surrounding territory. This approach was largely abandoned, however, during the interwar period. After that point, urban development spread into adjacent towns and townships organized under separate governments (Harris, 1996). By the end of the Second World War, governments recognized the need to remedy the problems associated with disjointed and poorly serviced development. As noted by White (2007) the first attempt to address these problems was the creation of the Toronto and Suburban (later Toronto and York) Planning Board, established in 1946. While it produced little of substance, it was evidence of a recognition of the need for some form of regional planning. A more radical solution was pursued a few years later in 1953, when the provincial government restructured local government in the region by establishing the Municipality of Metropolitan Toronto. Metro was the upper tier of a two-tier federation of 13 municipalities that included the core City of Toronto. The Metropolitan Toronto Planning Board (MTPB), which reported to Metro Council, was an independent board that exercised jurisdiction not only over the 13 municipalities within Metro, but also another 13 surrounding townships (see Figure 4.1). While Metro planned, financed, and constructed major infrastructure, the MTPB exercised control over land subdivision. The MTPB produced two draft comprehensive plans during its life (MTPB, 1959, 1965), but neither were made "official," or binding on lower-tier municipalities. The plans did, however embody planning principles that were followed in practice: contiguous urban growth and the full servicing of new development, both discussed further below. Although historically, the core towns of Ontario's counties -- originally the county seats -- had been permitted to secede from county government to become "separated cities" on reaching a certain population size, the regional municipalities reincorporated these cities into the two-tier structure, thereby creating a formal, integrated system of planning and governance for the cities and their rural hinterland at the county scale. In parallel to this restructuring of local government, the Ontario government embarked on a regional planning, transportation, and development scheme of its own -- the Toronto-Centred Region (TCR) concept. Building on the earlier Metropolitan Toronto and Region Transportation Study (MTARTS, 1966, 1967), the TCR was a scheme for redistributing population and employment growth within an area that stretched from Hamilton in the west, to Barrie north of Toronto, to Bowmanville in the east (Ontario, 1970a). The project was abandoned within a decade and produced few lasting results (Frisken, 1993:171-77; 2001; Richardson, 1981; White, 2007:20-32). Indeed, by the end of the 1970s, changing attitudes toward government intervention and local autonomy, fuelled by budget deficits, unstable minority governments, and recession, had led to a provincial volte-face. Planning legislation passed in 1983 was premised on the devolution of provincial planning and other powers to municipalities. Under the new regime, the Province would set general policies for planning and retain the authority to review and approve local comprehensive plans, but would remove itself from day-to-day planning matters. This process of delegating its planning powers to municipalities was most advanced in the Greater Toronto Area, where municipalities had developed relatively sophisticated in-house planning capacity. From a regional perspective, this was, as White puts it, the beginning of an "age of non-planning" (2007:32). At the local level, planning proceeded apace as urban development pressure washed over Metro's neighbours. For example, Mississauga, under the forceful leadership of Mayor Hazel McCallion, was converted in only a few short years from a handful of small and disconnected agricultural towns into a fully built-out city of several hundred thousand people (Urbaniak, 2009). Recognition of the need for regional coordination returned with the return of rapid growth in the 1980s. In 1988, the Liberal government established the Office of the Greater Toronto Area, which commissioned and published several important studies on alternative growth options and their costs, as well as the protection of natural heritage features (IBI Group, 1990; Kanter, 1990). These tentative moves toward comprehensive regional planning largely ended, however, with the election of the NDP in 1990 and the onset of a major recession (White, 2007:37). The 1991-2001 period was marked by a seesaw of provincial involvement in local and regional planning. The Liberal (1985-90) and NDP (1990-95) governments both imposed stronger controls on urban development and took steps towards developing a regional vision. The more market-oriented Conservative government (1995-2003) rolled back some of these policies early in its first mandate. It was only at the end of the study period that the Conservative government embarked on a program of regional planning -- the Smart Growth initiative (2001), which was continued and expanded by the Liberal government elected in 2003 (Ontario, 2006). Meanwhile, independently of the provincial government, local planning officials sought to coordinate their activities through regular meetings. By the end of the 1990s, the official plans of the regional municipalities and Toronto could be said to collectively constitute a de facto regional plan, though an inconsistent one with respect to land use and transportation. In sum, the Province of Ontario has always been a major, if inconsistent, player in Toronto-region affairs, leading Frisken to characterize the region as governed by a "provincial-local governmental system" (1993:160). Municipal plans and provincial policies in the Toronto region have long favoured contiguous, fully serviced greenfield development. In the period of growth since the 1950s, policymakers have recognized that urban development in the region depends on the Lake Ontario watershed. As a result, with a few exceptions, only fully serviced suburban development contiguous to existing urban areas has been allowed.3 This development has been accompanied by a program of comprehensive investment in lake-based water and wastewater piped infrastructure managed and funded first by the Municipality of Metropolitan Toronto and, later, by the provincial government in partnership with municipalities. After a spike in housing prices in the late 1980s that was blamed in part on a mismatch between supply and demand for housing, the Ontario government introduced a formal requirement for municipalities to designate a 10-year supply of land for future residential development based on long-term population forecasts, including three years of approved supply on serviced land (Ontario, 1989, policy 2). This provision has been maintained in all subsequent policy statements.4 While these policies state that the 10-year land supply is to comprise both greenfield land and sites within existing built-up areas, implementation of the policy appears to have favoured greenfield development (Filion, 2002). As a result of the long-term, consistent application of these planning principles, the urbanization of the Toronto region has been largely contiguous, on fully serviced land. Incremental urban expansion along the perimeter of the urbanized area has led to little leapfrog development and the absence of new, freestanding settlement areas (new towns). There has also been a longstanding policy preference at the provincial level and in some municipalities for intensification and nodal development. Since the late 1980s, provincial policies have called for growth to be accommodated within existing built-up areas where possible (Ontario, 1989, policy 5; 1992a, ss. 1.5, 1.7, 2.2; 2005, s. 1.1.2).5 Having largely exhausted its supply of greenfield land by the end of the 1980s, the Municipality of Metropolitan Toronto in particular sought in its final years to maintain a substantial share of regional population growth by promoting infill and redevelopment in the city (Metro Toronto, 1992:4).6 At the same time, the Regional Municipalities of Peel and Durham each committed to direct up to 20% of new growth to their existing built-up areas (Miller, Emeneau, & Farrow, 1997). The analysis in Chapter 3 shows that both exceeded these commitments in the 1991-2001 period: 22,745 out of 75,870 dwellings in Peel, or 30%, and 10,940 out of 35,545 dwellings in Durham, or 31%, were in the form of intensification. Provincial and municipal policies promoting the concentration of commercial and residential development on local and regional transit lines have also existed since the 1960s (Filion, 2007). For example, the 1969 City of Toronto Plan called for high-density redevelopment of areas around subway stations (s. 2.9). This policy largely failed, however, because of opposition from residents' groups. Constructed in the 1970s, the northern extension of the Spadina subway line (the western branch of the system's U-shaped north-south line) runs in the centre of a divided highway and has generated little intensification as a result. The 1983 Metro official plan also called for the concentration of residential and employment growth into mixed-use "subcentres" (Metro Toronto, 1983, s. 4) (see Figure 4.2). Two such centres -- Yonge-Eglinton and Yonge-St. Clair -- were largely developed by 1991 and the Scarborough and North York centres grew substantially in the 1990s. The other centres in the plan, Etobicoke-Islington and Kennedy, did not. (The Yonge-St. Clair and Kennedy centres are not mapped and quantified in this report.) Outside the City of Toronto, Mississauga City Centre, planned in the 1970s as a new downtown for the recently created municipality of Mississauga, began to fill in during the 1990s. The Province began to promote nodal development in the late 1980s and early 1990s (Ontario, 1992b). While not formalized in provincial policy during this period, the nodal concept was incorporated into municipal plans outside Metro (RPCO, 2003:4-6). By 1997, the official plans of all Greater Toronto Area municipalities (not including Hamilton) contained no fewer than 47 designated nodes, leading to a concern that infrastructure investment and growth was being spread too thin to have much effect (Miller, et al., 1997:7, 61, exhibit 25). Other municipal urban structure policies, including those intended to direct growth to main street corridors, appear to have had limited effect (Filion, 2007). 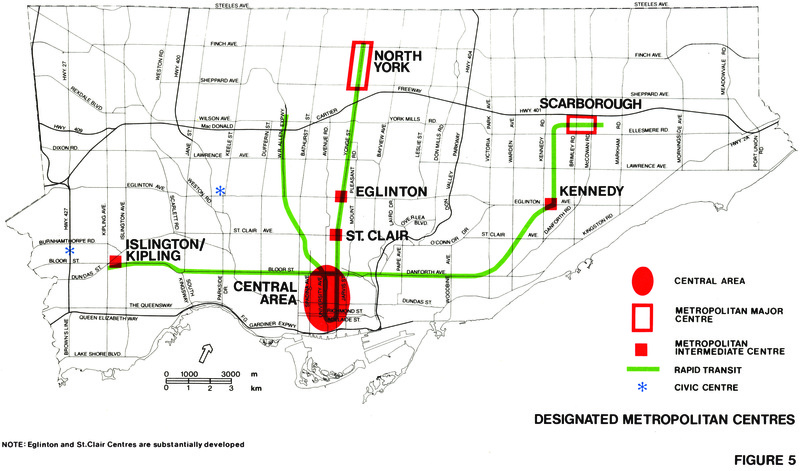 The "Official Plan for the Urban Structure," which was given effect in 1981, designated a hierarchy of transit-oriented "centres" on subway and rapid transit lines. 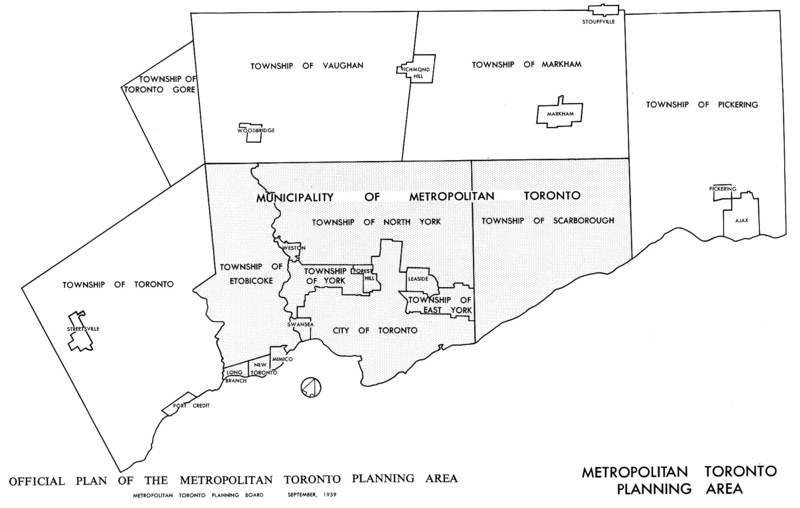 Its extraterritorial planning authority having been eliminated between 1971 and 1973, Metro's plan is concerned only with the area governed by the Municipality of Metropolitan Toronto. Source: Metro Toronto (1983). The protection of environmentally sensitive lands in the Toronto region has been more fragmented than comprehensive. A patchwork of federal, provincial, and municipal policies and plans identify or protect many specific natural features, both large and small. Environmental protection takes the form of protection of individual features such as wetlands (Fraser & Neary, 2004:113; Wright, 2000, s. 6). Many natural features are subject to minimal protection that is easily lifted when pressure mounts for conversion to urban use. As a result, protected individual features do not collectively function as an urban growth boundary for the region as a whole, nor are they intended to do so. Instead, urban development either overruns formerly protected features, or occurs around them. Provincial policies have also placed restrictions on the urbanization of agricultural land. Farmland may be designated as rural in local planning documents, but these designations are changeable. Successive policy guidelines and statements, to which municipalities must conform, have set criteria for the redesignation of agricultural land for urban use since the 1970s (Ontario, 1970b, 1976, 1978; 1992a, ss. 1.2, 1.7, 2.4, 5; 1995, ss. B7-9; 1997, ss. 1.2, 1.7, 2.4-5; 2005, ss. 1.1.3, 1.6). These policies have been criticized on the grounds that the criteria are easily set aside when urban development pressures rise (Penfold, Vigod, & Sewell, 1993:25; Walton, 2003:31). Nevertheless, to the degree to which they restrict the greenfield land supply, these barriers to development may promote denser development and greater intensification. The Niagara Escarpment and Oak Ridges Moraine are the most important exceptions to this patchwork. Established through provincial legislation, these two areas are comprehensively protected from urban development. The Niagara Escarpment is a 725-km-long ridge of sedimentary rock to the west of the Greater Toronto urbanized area. Because it was under threat from urban development and mineral aggregate extraction in the 1960s, the provincial government passed legislation to protect it in 1973, although it was not until 1985 that a statutory land use plan binding on municipalities was approved. In 1990 it was declared a UNESCO Biosphere Reserve. The Oak Ridges Moraine, an important location for groundwater recharge, runs across the northern fringe of the Greater Toronto urbanized area. By the 1990s, the Moraine was under pressure from urban development and aggregate mining. Public resistance and action by environmentalists led to a development freeze in 1999 and, in 2001, the establishment of a provincial land use plan, similar in structure to that created for the Niagara Escarpment. Municipal plans must be consistent with this plan. A regional approach to planning and governance has long been a feature of the Vancouver region. Municipalities have collaborated on a voluntary basis for service delivery since the beginning of the 20th century. Following two years of discussions, Vancouver, Point Grey, and South Vancouver (which were amalgamated into the City of Vancouver in 1928), along with Burnaby, voluntarily established the Burrard Peninsula Joint Sewerage and Drainage Board in 1913. This board, which was incorporated by provincial statute the following year, was renamed the Greater Vancouver Sewerage and Drainage District in 1957, and absorbed into the Greater Vancouver Regional District (GVRD) in 1971. Its model of voting strength and financial contributions more or less in proportion to the populations of member municipalities and the quantity of services provided was the template for later organizations, including the Greater Vancouver Water District, founded in 1924. The territorial jurisdictions of these intermunicipal collaborative organizations have grown as additional municipalities have joined. Drafted by Harland Bartholomew in 1946, this map clearly delineates the boundaries of the Lower Mainland. It is a close copy of a map contained in the provincial government's Preliminary Report on a Proposed Lower Mainland Regional Plan, published the previous year. 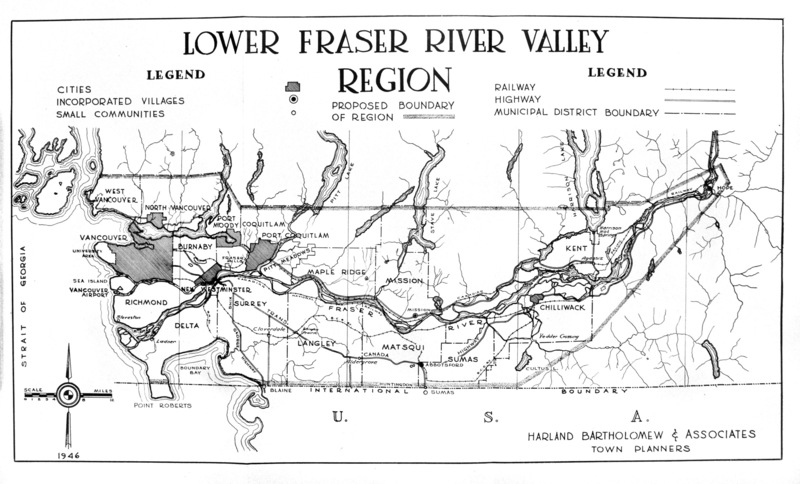 This area, which today is divided into Metro Vancouver and the Fraser Valley Region District, has been considered a relevant regional planning unit since at least the 1940s. Interest in regional planning and development revived in 1942 when the provincial government created a Post-War Rehabilitation Council to make recommendations on British Columbia's economic development following the anticipated return of prosperity. Its reports (Perry, 1944) advocated regional economic development policies tailored to all parts of the province. The management of land was seen as an integral part of this project, though this was primarily understood in a non-urban context. 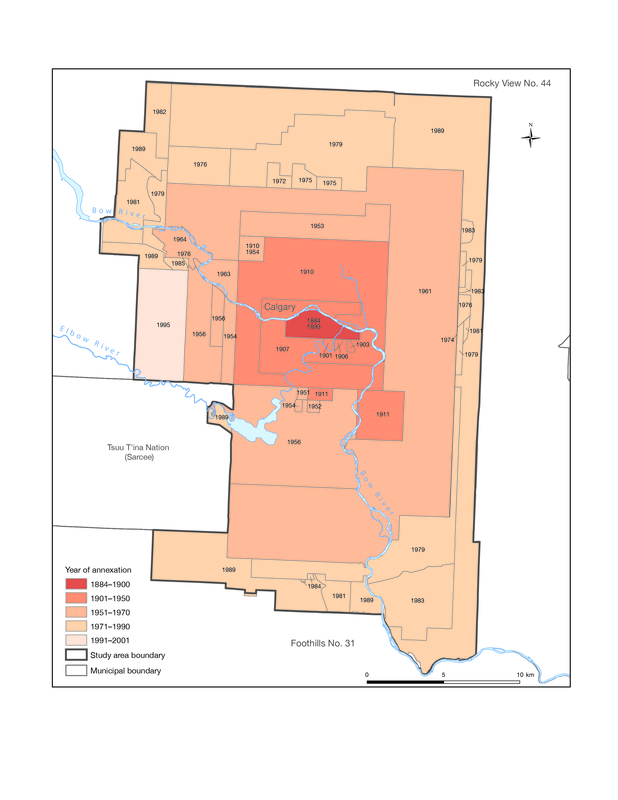 Only a very small proportion of the province's territory is arable and can support urban settlement; the Council was concerned with opening up the interior to economic development and resource extraction, not the management of urban development. Still, one of the first acts of the Regional Planning Division of the Bureau of Post-War Rehabilitation and Reconstruction, established in 1945 on a recommendation of the Council, was to produce a Preliminary Report on a Proposed Lower Mainland Regional Plan (Regional Planning Division, 1945) that contained a survey of the Lower Mainland's land uses, servicing capacity and requirements, transportation needs, and telephone and electricity infrastructure (see also Wilson, 1952). This report paralleled discussion at the local and provincial levels on the need for a provincial planning commission that would directly undertake regional planning for the territory of the Lower Mainland (see Figure 4.3). Several events militated against a direct provincial involvement in regional planning, however. Buttressed by a commissioned report by American consultant Harland Bartholomew (1946) on the need for orderly regional decentralization, the Vancouver Town Planning Commission pressed the case for regional planning legislation (see Figure 4.4). Independently, the head of the newly formed B.C. division of the federally funded Community Planning Association of Canada also successfully lobbied for an amendment in 1948 to the Town Planning Act, enabling the creation of advisory regional planning boards. Finally, the catastrophic flood of the Fraser River in 1948 has been credited with solidifying a regional consciousness spanning the Lower Mainland as a whole (Harcourt et al., 2007:13-14). The cover of Harland Bartholomew's 1946 report on regional planning for the City of Vancouver's Town Planning Commission is remarkable not only for its inventive fictional vantage point, looking southeast from high above the city, but also for presaging the later notion of "cities in a sea of green," hemmed in by mountains, ocean, and the American border. The not-yet-connected urbanized areas of the Vancouver and New Westminster are clearly shown, as is the network of towns along the Fraser River, White Rock at the international border, and North and West Vancouver on the north side of Burrard Inlet. At the upper left, where the valley narrows, is the town of Hope, 160 km by road east of Vancouver. The Lower Mainland Regional Planning Board (LMRPB), which was financially supported by area municipalities and the Province, was established in 1949 under the revised Town Planning Act. Over the next 15 years, it undertook an extensive program of study (Jackson, 1964; LMRPB, 1952), which culminated in a proposed "outline plan," Chance and Challenge (1963a). This document and accompanying background reports argued that without intervention, the supply of urban land would be exhausted by the end of the millennium, and that the best option was to pursue a region-wide policy of infill and redevelopment of existing urban areas, the comprehensive protection of agricultural land whereby only fully serviced greenfield development would be permitted, and the direction of growth to self-sufficient "regional towns" connected by highways (LMRPB, 1956, 1963a, 1963b). (See Figure 4.5.) These principles were entrenched in the Official Regional Plan of the Lower Mainland Planning Area (1966), which was approved by the necessary two-thirds of local municipalities. The LMRPB envisioned a series of "cities in a sea of green" connected by highways. In 1965, the provincial government embarked on a program of dividing the entire province into regional districts -- a new, more flexible form of local government. Under the new system, municipalities would band together into multi-purpose federations on a voluntary basis to provide services. Much as with the water and sewerage and drainage boards in Greater Vancouver, district boards would be made up of municipal council representatives in proportion to each municipality's share of the population. In sparsely populated areas, territories without incorporated municipal government would be represented on the board as "electoral areas." The creation of the regional districts occurred after an abortive attempt to create a Toronto-style two-tier metropolitan government for Vancouver. A Metropolitan Joint Commission was established in 1957 with financial support from area municipalities and the provincial government. The commission conducted an extensive study of metropolitan governing arrangements between 1958 and 1960, funding studies by academics and professional consultants, engaging in community outreach, and making study visits to cities around the world. The commission recommended creating a metropolitan government, but the option was strongly opposed by area municipalities and quickly abandoned by the provincial government. In 1967, after regional districts had been established in most of the province, the Lower Mainland was divided into four regional districts, including the Greater Vancouver Regional District. Although at first it appeared that the LMRPB would co-exist with the new system of regional districts, the province abolished the LMRPB in 1969. The Board's power to create regional plans was transferred to the four regional districts. The 1966 plan would remain in force, collectively maintained by the regional districts through a newly created Review Committee. The regional districts began with very limited powers. Indeed, the GVRD was deliberately crafted to avoid appearing to be a Metro Toronto-style metropolitan government. However by 1972, the GVRD had absorbed all of the functions of the many special-purpose bodies active in the region (Tennant & Zirnhelt, 1973). 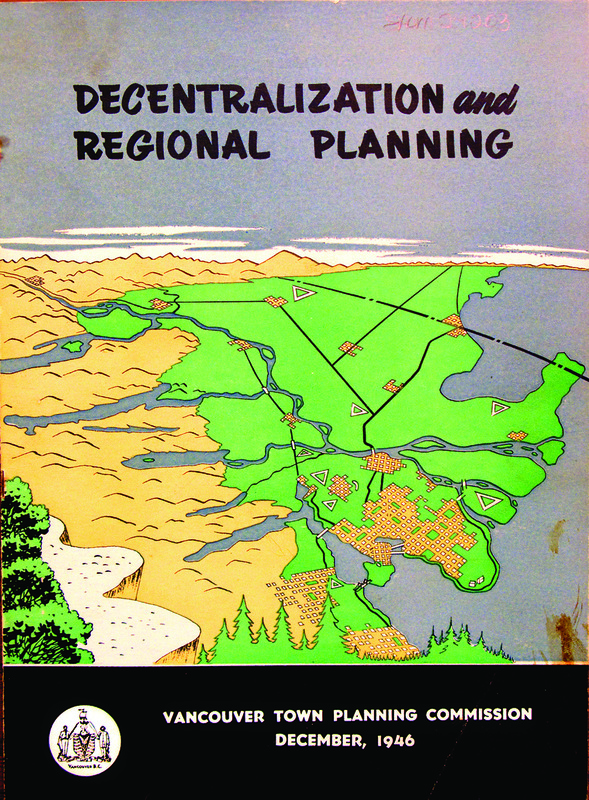 The GVRD's first statement of a land use planning vision, Livable Region 1976/1986, was released in 1975 (GVRD, 1975). While often referred to as the "Livable Region Plan," the 1975 document was not a traditional "blueprint" plan that defined zones and regulated uses within them. Rather, it was considered by its authors to be a set of ever-evolving "proposals" to guide planning policies. With provincial support, the four regional districts jointly reviewed and revised the 1966 Official Regional Plan between 1977 and 1980 (CFVRD et al., 1980; Lower Mainland Plan Review Panel, 1979). This revision reaffirmed the earlier plan's principles and incorporated the planning ideas articulated in the Livable Region program. 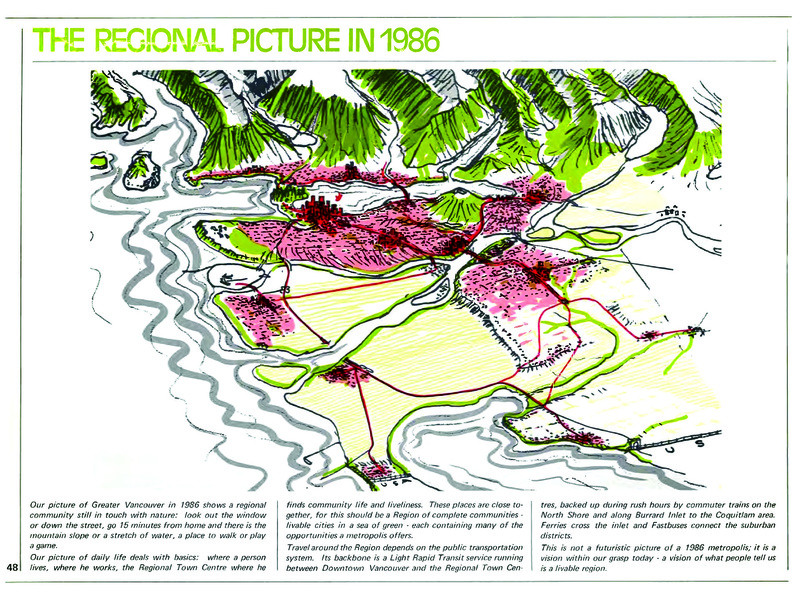 The GVRD's planning program was interrupted in 1983 when the Social Credit provincial government, after a protracted dispute in Delta that pitted the GVRD against the provincial cabinet, abolished the planning authority of regional districts and annulled existing regional plans (Harcourt et al., 2007:70-72; Oberlander & Smith, 1993:363). The government's impulse toward deregulation was not limited to planning. Indeed, the abolition of regional planning was but one small part of a much larger legislative package that touched on all aspects of provincial government activity (Magnusson & Carroll, 1984). Area municipalities, however, voluntarily continued to cooperate on regional planning initiatives under the rubric of "development services" (Cullingworth, 1987:372-373; Smith & Oberlander, 2006:157; Tomalty, 2002:434). Propelled by the leadership of future premier Gordon Campbell, then mayor of Vancouver and GVRD chair, work on a new regional plan began in 1989, six years before formal regional planning authority was restored. Over 50 "regional actions" were adopted by the GVRD board of directors in 1990 (GVRD, 1990), and the Livable Region Strategic Plan (LRSP) was adopted in 1996 (GVRD, 1996). Following the defeat of Social Credit and the election of the New Democratic Party (NDP) in 1991, the LRSP was given effect by the legislative restoration of regional planning authority in 1995. Under the legislation, a "regional growth strategy" can come into effect only with the consent of all affected local governments. While the GVRD is the steward of the regional plan, there is no legislative requirement that local municipal plans conform to it. The development and implementation of a regional vision depends on intermunicipal cooperation. This cooperation has not always been forthcoming. Surrey, for example, voted in 1994 to partially reject the higher housing densities specified in the draft plan (Tomalty, 1997:54-56). Langley Township and Richmond also resisted the plan. In the end, Surrey and Langley Township negotiated settlements with the GVRD on their own. Richmond was brought on board only after the legislation's dispute settlement mechanism was invoked and found in the GVRD's favour (Harcourt et al., 2007: 144-48). Still, it seems that, as Oberlander and Smith put it, a "regional consensus was achieved early [and] maintained consistently" (1993:363). ... this is an unusually well-defined region ... since nothing can escape the strong regional forces, the best thing to do is to acknowledge them, and try to make a better adjustment to them. The region is so compact that the spread of cities, if unwisely carried out, may adversely affect agriculture or recreation, without much possibility of compensation from outside the areas; the pattern of routes has less margin for error than in most lowlands; the choice of suburban or new industrial sites will have more than usual ramifications. This is a strong argument for planning. ... Should the population reach the 1,500,000 which is postulated within the foreseeable future, then it will be of utmost importance to leave agriculture as much available land as possible (Watson, 1952). The notions of land scarcity and a direct trade-off between urban development and agriculture persist in later LMRPB (1963a) and GVRD reports and plans, and are the foundation of the provincial Agricultural Land Reserve, discussed below. After the Second World War, observers remarked on the discontiguous nature of land development in the region's fringe. A 1963 report of the LMRPB, Land for Living, notes that land development thus far had been scattered and "un-compact," and suggests that the entire supply of "suitable and available" land in the region would be urbanized by the end of the 20th century, when a population of 2.25 million was expected to be reached. More directly, the report states that scattered, low-density patterns of urbanization in the region had resulted in very poor levels of servicing. In comparison with Toronto and Calgary, which had each achieved almost universal connection of dwellings to sewer systems, only 68% of all dwellings in the Vancouver region were hooked up in 1961, and 36% in fringe areas (LMRPB, 1963b: 10). Unless densities were increased, the report argued, newly urbanized areas would not have adequate sewer and water services, let alone sufficient levels of street paving and lighting, fire protection, schools, parks, and bus transit (LMRPB, 1963b: 14). On this basis, the 1963 report and subsequent regional plans and policy statements called for greenfield development that would be compact, contiguous, and of sufficient density to support economic provision of services. The concept of regional town centres was carried forward into the 1996 plan. Although the town centres failed to capture much office growth, they successfully attracted residential and retail development (Artibise et al., 1990; GVRD, 2003). Indeed, the population of the regional town centres grew faster than that of the region as a whole between 1991 and 2001 -- 43% versus 26% (GVRD, 2006b;5). The 1996 regional plan defines a Growth Concentration Area (GCA), which comprises the core urbanized areas of the Cities of Vancouver, Burnaby, New Westminster, Coquitlam, Port Coquitlam, Port Moody, Anmore, Surrey, and Delta. The plan proposes that 70% of the GVRD population should be located in the GCA by 2021, up from 65% in 1991 (GVRD, 1996:12). This policy builds on the 1980 Official Regional Plan, which set targets for new urban development directed to the GVRD (rather than farther east in the Fraser Valley) and to the north side of the Fraser River (CFVRD et al., 1980:16-22). The 1966 Official Regional Plan provided for five general zoning designations: urban, rural, industrial, park, and reserve. Rural and park areas were to be protected from encroachment by urban uses. The provincial government established the Agricultural Land Reserve (ALR) in 1973. The ALR is a zoning plan that excludes from urban development approximately 47,000 km2 of agricultural land province-wide -- about 5% of the province's land base. While the initial ALR proposal involved compensation to landowners for the forgone value of their land, in the end, the reserve was established solely through land use zoning (Petter, 1985). All local and regional planning authorities are required to ensure that their bylaws and plans are consistent with the provisions of the Agricultural Land Commission Act, as well as regulations and orders of the Commission. While not immune to provincial political interference (Oberlander & Smith, 1993:361-63), the Commission is an independent body to which governments and landowners must apply when land is proposed to be added to or removed from the ALR. The 1996 regional plan also established a Green Zone of about 210,000 hectares (Metro Vancouver, 2008) to "define the limit to urban expansion" and "foster a shared sense of commitment between the region's municipalities to protect the lands within it" (GVRD, 1996:10). The Green Zone, which was defined through lengthy consultation with municipalities, residents, and NGOs, comprises floodplains, ecologically important lands, major parks and recreation areas, forests, and ALR lands located within the region (GVRD, 1992, 1997). Calgary has had a robust system of local and regional planning for much of the last half-century. A municipal planning department was established in 1950 and the advisory citizen Town Planning Board was replaced by a Technical Planning Board of city staff in 1951. This was a remarkable degree of professionalization for what was then still a municipality of only 129,000 people. The new planning director, A.G. Martin, promoted modern methods of planning, emphasizing orderly development (Sandalack & Nicolai, 2006:79). The 1963 Calgary General Plan was the first statutory municipal plan in western Canada (Sandalack & Nicolai, 2006:78). The second feature is a regional tier of planning authorities. Between 1951 and 1994, Alberta's planning legislation provided for regional (earlier known as district) planning commissions. These were hybrid provincial-local bodies, with members appointed by municipalities and various provincial ministries and agencies. Calgary's was established by order-in-council in 1951. In the 1950s and 1960s, the primary role of these commissions was to exercise control over the approval of rural subdivisions and to aid and advise municipalities on local planning matters. In these early years, the District Planning Commission had little power to influence either the annexation process or how annexed greenfield land was developed. After 1977, however, municipal plans were required to conform to regional plans, which in turn had to conform to provincial policies (Masson & LeSage, 1994:414-22). Ratified in 1984, Calgary's third and final regional plan built on earlier draft plans prepared in 1962 and 1971. Observers agree that despite skirmishes between the regional commissions and municipalities, the two-level system functioned effectively (Cullingworth, 1987:340-47; Masson & LeSage, 1994:422; Alberta, 1981). In 1994, the Progressive Conservative government, led by former Calgary mayor Ralph Klein, abolished regional planning commissions (Hodge & Robinson, 2001:257-58). The revised Municipal Government Act, 1994, established mechanisms for intermunicipal planning and cooperation and, in 1996, introduced a set of general Land Use Planning Policies. Under the act, municipal decisions must "be consistent" with these principles (Alberta, 1996, s. 622). Foran (2009, ch. 1) notes that beginning in the 1950s, a tacit agreement between the large builder-developers and the City led to a policy of constructing subdivisions composed of single detached houses on wide lots. Alberta's provincial policies and Calgary's local and regional plans from the 1970s to the present have been more concerned with facilitating growth than with containing it. In general, local plans have emphasized orderly, contiguous development with full water and sewer services (Tomalty & Alexander, 2005:56). The City of Calgary has operated citywide water and sewer utilities for most of the 20th century. Trunk mains were extended from incrementally expanded central plants, ensuring fully serviced urban expansion. The 1984 regional plan sought to minimize scattered, unserviceable, or premature subdivision of rural land, and called for the comprehensive planning of annexed areas (Calgary Regional Planning Commission, 1984). The City's Long-Term Growth Management Strategy (1986) emphasized the need to secure and expand a 30- to 60-year supply of developable land at the urban fringe (Sandalack & Nicolai, 2006:113, 141-42). The provincial Land Use Planning Policies enacted in 1996 state that land use patterns are to be "developed in an orderly, efficient, ... and economical manner" (s. 4.0(1)), "embody the principles of sustainable development" (s. 4.0(2)), and "make efficient use of existing facilities, infrastructure and public transportation" (s. 4.0(5)). With respect to the protection of the environment and natural resources, the policies call for the mitigation of negative impacts and limit the "fragmentation of agricultural lands and their premature conversion to other uses" (ss. 6.0-6.1). On the topic of residential development, the policies encourage municipalities to establish land use patterns in response to identified housing needs and to "provide intensification opportunities within developed areas where existing infrastructure and facilities have adequate capacity" (s. 8.0(1,3)). Since it will take time for these policies to find expression in local plans and development patterns, this analysis of the 1991-2001 period cannot indicate whether these policies are effective. The City's Sustainable Suburbs Study (1995b) did not cite reducing encroachment on surrounding rural land as a rationale for more compact development. Rather, it was primarily concerned with controlling the cost of infrastructure and service provision, meeting community social needs through mixed-use development, and reducing pollution. The study proposed developing new areas at a density of greater than 7 units per acre (17.3 units per hectare) and adopting transit-oriented development design principles to promote walkability and transit use. Sandalack and Nicolai suggest that the study had little influence on the design of subsequent suburban development (2006:144). The first local plan passed after the abolition of the regional planning commission, the City of Calgary Plan (1998), addresses regional growth management only briefly. It contains policies to divert urban development away from natural resource deposits such as aggregates and sour gas wells (38). It also calls for increases in "overall residential densities and the efficiency of the development of land" on greenfields (37), as well as improved "land stewardship and protection" through more "efficient use of the land base (i.e. reduce and/or contain total land absorption)" (23). The section on residential land development, however, justifies the City's power to annex adjacent land, approve subdivisions, and provide infrastructure solely in terms of avoiding premature public investment (41-43). City of Calgary plans have generally ignored the potential for general or targeted intensification. For example, in the lead-up to the adoption of the Balanced Growth Strategy in 1977, eight scenarios were circulated, each proposing a different spatial distribution of forecast growth between peripheral and established areas. The approved policy directed growth almost entirely to greenfield areas (Foran, 2009:118-21). Calgary's 1998 plan also contains several policies related to the distribution of growth within the existing urban area. It seeks to increase residential densities throughout the existing urban area through "sensitive intensification" (38-40). The plan also promotes the concentration of employment uses into transit-connected "centres" in order to improve transit use and jobs-housing balance (31-35), although the locations of these centres are not specified. In addition, the plan seeks to reinforce the downtown core as the principal focus of retail and office activity in the region (78-79). The origins of these policies can be found in the 1970 and 1979 Calgary plans, which also sought to channel population and employment growth to the downtown as well as to rapid transit corridors and station areas (City of Calgary, 1970, parts 1.2, 2.5, & 3.5; 1979, H21-H25, T12, s. 24). The 2005 Calgary Transportation Plan, however, concedes that to date these policies have been less than successful (City of Calgary, 2005:16). Calgary's regional planning principles can be summed up by the language of its current comprehensive plan: "While sensitive intensification is advocated across the existing built-up area, most of the growth will occur in new suburbs at the city's edges" (City of Calgary, 1998:89). Since the mid-1990s, policymakers have focused on manipulating the form of development on greenfield land and in existing urban areas rather than increasing the proportion of total growth accommodated through intensification. Calgary does not face near- or even long-term physical or policy limits on outward greenfield development. While municipal and provincial plans call for the protection of natural features such as river valleys, there has been no move to comprehensively protect adjacent rural land either for its own sake or as a means of urban containment. This situation may change, however, as policymakers recognize the limitations on Calgary's fresh water supply (CBC, 2006; Chen et al., 2006). Table 4.1 summarizes the review of regional planning institutions, policies, and principles described in this chapter. The City of Calgary is a de facto regional government as it takes in the majority of the metropolitan population. Local and regional policies and plans (1960s-present). Alberta Land Use Policies (1996) encourage intensification where capacity exists. City of Calgary Plan (1998): "sensitive intensification." Centres and nodes in Metro Toronto and local and regional municipal official plans (1980s-present). Intensification of transit station areas and corridors (1979-present). (1985) and Oak Ridges Moraine Conservation Plan (2001). Comprehensive protection: ORP rural zoning (1966-83), ALR (1973-present) and Green Zone (1996-present). Other than Fish Creek Provincial Park, Nose Hill Park, and river valleys, no areas of comprehensive protection. 1. The creation of the Regional Municipality of York in 1971 and those of Durham, Halton, and Peel in 1973 reduced the MTPB's geographic reach to the borders of the Municipality of Metropolitan Toronto. The MTPB was abolished in 1975, and its staff was transferred to a newly created planning department of the Metro Toronto government. 2. For differing accounts and perspectives on Toronto's highly contentious amalgamation, see Boudreau (2000), Garcea and LeSage (2005), and Sancton (2000). In addition, a new City of Hamilton was created in 2001 through the amalgamation of the Regional Municipality of Hamilton-Wentworth and associated lower-tier municipalities. These amalgamations were part of a broader program of municipal consolidations driven by the Conservative government in office between 1995 and 2003 that cut the total number of municipalities in Ontario in half. 3. The origin of this principle is found in the 1959 Metropolitan Toronto Planning Board plan (MTPB, 1959, chs. II, X; 1965, Pt. I(A)). It was later incorporated into provincial planning policies binding on municipalities. See Ontario (1989, policy 2; 1992a, ss. 1.2, 1.7, 2.4, 5; 1995, ss. B7-9; 1997, ss. 1.1, 1.3; 2005b, ss. 1.1.3, 1.6). 4. Since 1983, the Ontario Planning Act has enabled the provincial government to enact "provincial policy statements" to which municipal plans and undertakings must adhere. 5. The Provincial Policy Statement in effect between 1997 and 2005 did not call for intensification to be pursued prior to greenfield development, but did "encourage" residential intensification in areas with infrastructure capacity (Ontario 1997: s. 1.2(d)). 6. The Municipality of Metropolitan Toronto was abolished in 1998 with the amalgamation of the two-tier municipal federation into a new, unitary City of Toronto. The new City has continued Metro's emphasis on transit-oriented nodes and corridors. 7. The correspondence and meeting minutes of the group are held at the City of Vancouver Archives, Town Planning Commission fonds, s. 397, loc. 61-D-6, file 9. 8. Assessing whether or not the ALR is effective at protecting and promoting agricultural production is beyond the scope of this paper. See Garrish (2002/03) and Campbell (2006) for differing perspectives. 9. These values do not differ significantly from the 1991-2001 intensification rate estimate of 22% observed in the previous chapter.